James Naismith (1861-1939) was a Canadian sports coach who, in December of 1891, took a soccer ball and a peach basket into the gym at the Springfield, Massachusetts YMCA and invented basketball. Over the course of the next decade, he worked to refine the game and its rules and build its popularity. In 1936, basketball had become an official event at the Olympic Games in Berlin. Died: November 28, 1939, in Lawrence, Kansas, U.S. Notable Quote: "The invention of basketball was not an accident. It was developed to meet a need. Those boys simply would not play 'Drop the Handkerchief.'" ...“Duck on a Rock” which was a game that combined tag with throwing. Players formed a line from a distance of 15-20 feet from the base stone. Each player used a fist-sized stone. The object was to dislodge the “guards” stone from the top of the base stone, by throwing, taking turns. The guard would be positioned in a neutral area away from the thrower. If one succeeded, they would go to the back of the line. If you missed the guards’ stone, the “chase” would be on and if tagged before the stone was recovered, the players would trade places. As a young man, Naismith attended McGill University in Montreal, Quebec followed by theological training at Presbyterian College. After serving as McGill's athletic director, Naismith moved on to work at the YMCA Training School in Springfield, Massachusetts, in 1891. At the YMCA Training School, athletes found themselves at loose ends between the end of the football season and the start of the baseball season. Several trainers were asked to develop a sport to keep students physically active during the down season; the new game was to have two stated objectives: “make it fair for all players, and free of rough play." After considering the balls and rules of play for several popular sports including rugby, lacrosse, football, and soccer, Naismith developed a basic game which involved throwing a soccer ball into peach baskets. The larger soccer ball, he felt, would slow down play to avoid collisions. A player cannot run with the ball. The player must throw it from the spot on which he catches it, allowance to be made for the man who catches the ball when running if he tries to stop. When the ball goes out of bounds it shall be thrown into the field of play by the person first touching it. In case of a dispute, the umpire shall throw it straight into the field. The thrower-in is allowed five seconds; if he holds it longer it shall go to the opponent. If any side persists in delaying the game, the umpire shall call a foul on that team. Following his time at the YMCA, Naismith went on to work for the University of Kansas, initially as a chaplain. At that time, basketball was played at the college level, but competition was usually between YMCA's. It was Naismith and other Kansas coaches who helped to push the game into greater prominence, though Naismith himself did not seek the spotlight. 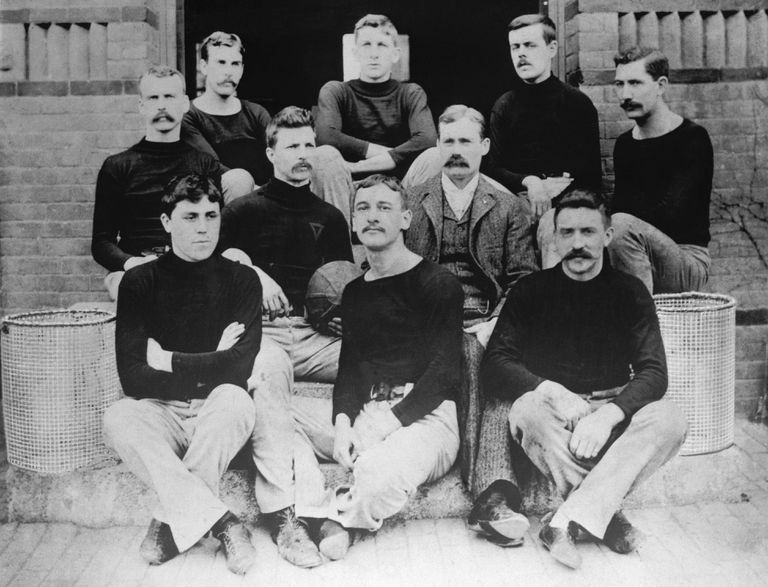 The first-ever college basketball game was played on January 18, 1896. On that day, the University of Iowa invited student-athletes from the new University of Chicago for an experimental game. The final score was Chicago 15, Iowa 12, which was very different from the hundred-point scores of today. Naismith lived to see basketball adopted as an Olympic demonstration sport in 1904 and as an official event at the 1936 Summer Olympics in Berlin, as well as the birth of the National Invitation Tournament in 1938 and the NCAA Men's Division I Basketball Championship in 1939. College basketball games were first broadcast on national TV in 1963, but it wasn't until the 1980s that sports fans ranked basketball as high as football and baseball. James Naismith died of a brain hemorrhage in 1939 and was interred at Memorial Park Cemetery in Lawrence, Kansas. The Naismith Memorial Basketball Hall of Fame in Springfield, Massachusetts, is named in his honor. He was an inaugural inductee in 1959. The National Collegiate Athletic Association also rewards its top players and coaches annually with the Naismith Awards, which includes the Naismith College Player of the Year, the Naismith College Coach of the Year and the Naismith Prep Player of the Year. Naismith was also inducted into the Canadian Basketball Hall of Fame, the Canadian Olympic Hall of Fame, the Canadian Sports Hall of Fame, the Ontario Sports Hall of Fame, the Ottawa Sports Hall of Fame, the McGill University Sports Hall of Fame, the Kansas State Sports Hall of Fame and FIBA Hall of Fame. Naismith's hometown of Almonte, Ontario hosts an annual 3-on-3 tournament for all ages and skill levels in his honor. Every year, this event attracts hundreds of participants and involves over 20 half-court games along the main street of the town. “Dr. James Naismith's Life.” Naismith Basketball Foundation, 13 Nov. 2014, naismithbasketballfoundation.com/james-naismith-life/. Editors of Encyclopaedia Britannica. “James Naismith.” Encyclopædia Britannica, Encyclopædia Britannica, Inc., 1 Feb. 2019, www.britannica.com/biography/James-Naismith.